Nkosazana Dlamini-Zuma, one of the runners in the race for South Africa’s ruling party leadership and newly-appointed lawmaker, faces difficulty distancing herself from her tarnished ex-husband President Jacob Zuma. The ruling African National Congress (ANC) veteran is an experienced technocrat who has served as minister under all post-apartheid leaders since the end of white minority rule in 1994. But running for the ANC top job may prove to be her biggest challenge yet, even though she is not tainted by the same corruption scandals that have defined Zuma’s term in office. Zuma is fighting to fend off the possible reinstatement of 783 corruption charges related to a controversial 1990s arms deal. As a result Dlamini-Zuma has been forced to defend herself against critics who believe her elevation would simply be a continuation of Zuma’s scandal-tainted rule — and that she could shield him from possible criminal prosecution. If elected at the party conference in December, Dlamini-Zuma would likely become ANC presidential candidate for general elections due in 2019. Neither the ANC nor South Africa have yet had a woman leader, and being a pathfinder in this role would be to Dlamini-Zuma’s advantage. She has angrily rejected “offensive” critism that she is her ex-husband’s hand-picked successor, and so cannot be trusted with power. Zuma has thrown his weight behind her, describing her as “bold” and “someone you can trust”. But critics are yet to be convinced. “She is an enigma… a very difficult person to judge, simple because she has always operated under someone else’s shadow,” said political analyst Susan Booysen. “Her support is largely based on her husband’s constituency,” she said. Dlamini-Zuma, 68, has received backing from several other powerful corners of the party including its women’s and youth wings. Her return to parliament this week, five years after quitting to lead the African Union (AU) Commission is seen as a major stepping stone in her bid to win the ANC top job. “I would love to see her become her own person… what I see is someone who won’t be her own leader if she is elected,” said Booysen. Her time at the AU has been described as “uninspiring” and she is accused of failing to reform the institution. A medical doctor by training, Dlamini-Zuma is of the generation of ANC leaders who were exiled during apartheid for their political activism. After the end of apartheid in 1994, Nelson Mandela appointed her health minister. She took the helm during a period when millions of people died from AIDS, although she did not serve under Mandela’s successor, Thabo Mbeki, who was bitterly accused of allowing the disease to advance through inaction and superstition. In 1998, Dlamini-Zuma was criticised for suspending pilot trials on the use of anti-retrovirals to prevent mother-to-child HIV transmission, claiming they were “unaffordable”. But she championed HIV awareness schemes — including “Sarafina II”, a stage play that embroiled her in a corruption scandal over its cost. South Africa’s graft watchdog ruled that she misled parliament over the project’s funding in a scandal that blemished her otherwise impressive record of public service. Taking charge of the deeply divided ANC would arguably be Dlamini-Zuma’s crowning political achievement — shattering the glass ceiling that still confronts women in South Africa’s male-dominated political scene. 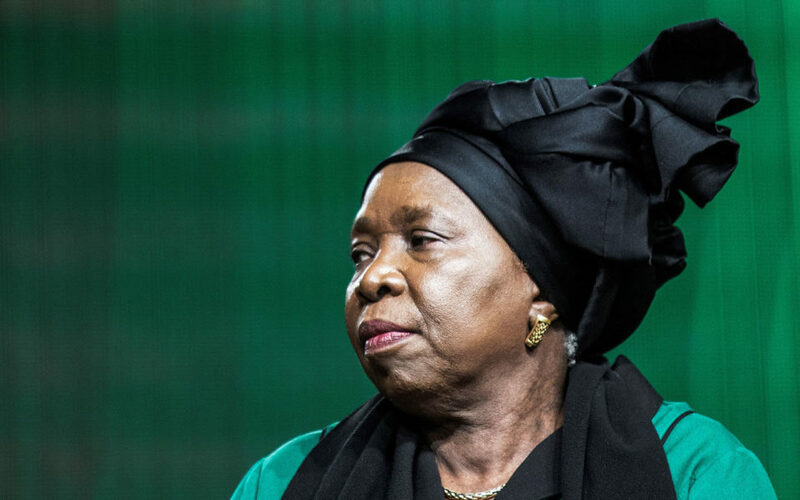 According to Carin du Plessis, author of “Woman in the Wings: Nkosazana Dlamini-Zuma and the Race for the Presidency”, some foreign diplomats report “very negative” encounters. Zuma has also suffered similar accusations from his critics. “If she does not like you, she is not afraid to show you that she does not like you,” Du Plessis told AFP. Dlamini-Zuma has also been muted on key issues like corruption, instead carefully treading the partly line and delivering speeches best described as tepid — and inoffensive to Zuma. “I think she might be her own person as far as it comes to governance,” said Du Plessis, adding that prosecuting Zuma under a Dlamini-Zuma presidency would be messy because of the ties they still have as a result of their children.